I get a lot of emails asking for new chicken recipes, since it is the most popular meat in America. I took influence from my recent trip to Tuscany and found this simple and delicious recipe called Pollo al Mattone which means “chicken under a brick”…but I decided to eliminate the brick and instead I cooked it in my cast iron skillet. If you don’t already own one, go and purchase a good cast iron skillet. It will last you forever and you can create such amazing flavor by using it. The marinade is very important with this recipe, so you just need to prep it the night before, with the bird and the herbs and let it sit in the fridge overnight to maximize the flavor. 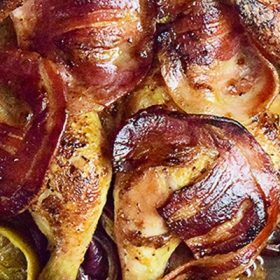 Nonna makes this with slices of pancetta on top of the chicken, so I did too, which keeps it the meat moist but also adds a wonderful bacon-like flavor. I hope you add this new dish to replace some of your outdated chicken recipes, I know your family will be happy that you did. This chicken recipe takes a different spin and it’s delicious. In a medium bowl add the garlic, rosemary, thyme, salt, pepper, chili flakes, olive oil and lemon juice and mix well. Generously season the chicken with salt and pepper and pour the marinade mixture to coat completely, massage for 1 minute. Cover the bottom of the cast iron skillet with some of the sliced onions, and add the chicken skin side down. Put the rest of the onions on top and cover the pan with plastic wrap, transfer to the fridge and let it marinate for 24 hours. Take the chicken, onions and marinade out of the skillet and transfer to a plate. Heat the skillet on the stove over medium-high heat with 1 tablespoon of olive oil, when hot, place the chicken skin side down and sear for about 5 minutes or until the skin turns golden brown. Turn the heat off and remove the chicken. Add the onions back to the bottom of the skillet and put the chicken skin side up on top of the onions and add the marinade and pancetta slices on top. Transfer to the oven and roast at 400° for 35 to 40 minutes or until internal temperature reaches 165°. Cut the chicken with a kitchen knife and serve it. Let it rest for 15 minutes before serving. The casatiello is a traditional Neapolitan bread that is made as part of Easter celebrations. Typically donut shaped, it features a mixture of water, lard, lots of pepper, and brewer’s yeast. It is also enriched with many different varieties of cheese; in particular, pecorino and cured meats are hidden inside. The main difference between the casatiello and its relative the tortano is that for the casatiello the eggs are placed on top of the bread, secured by a cross of dough, and then baked. 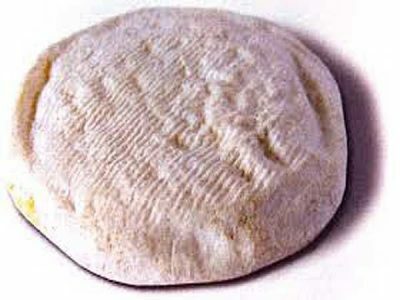 The Treccani online dictionary defines “casatiello” as a masculine, Neapolitan noun, derived from the Latin caseus cheese. The dictionary describes it in two different forms: the more popular salty preparation as well as the less well-known but equally delicious sweet variant. The sweet version is found in some areas of Campania, particularly in the Caserta area, and is characterized by a dough containing brewer’s yeast. After the bread has been cooked, white icing and diavulilli (colored sprinkles) are added. In Naples, as in most of Campania, if anyone asks for a casatiello, they inevitably mean the salty variety. The origins of this rustico date back many hundreds of years. In fact, the first evidence of this traditional recipe can be tracked as far back as ancient Greece, where we find the first references to bread seasoned with various ingredients: the plakountes. A similar focaccia was part of the offerings in honor of Demeter, as it appears in a work of art in the Louvre showing a procession in which there are some loaves that each have a hole in the center. This type of Greek bread was then named, with some local variations, from the Roman word that adds the adjective caseata, from the Latin word caseus. Although it is a traditional Easter recipe, it is not served on Easter Sunday but offered to family and friends starting on Holy Saturday, but absolutely not before. It is removed on Easter Monday during lunch. 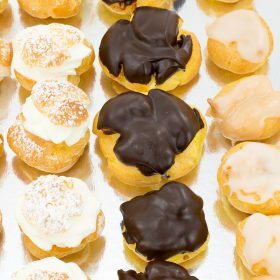 In Naples, it is said that it should never be eaten before Saturday because of “S’adda sciogliere a’ Gloria,” an expression that refers to the conclusion on Easter Sunday of the rites of the Easter Triduum, the days of mourning for the church. With the lighting of the Easter Candle and the sounds of bells, the resurrection of Christ is celebrated. In this way, fasting ends, and at home, the meats and desserts are returned to the tables. CASATIELLO ON EASTER TIME – WHY? 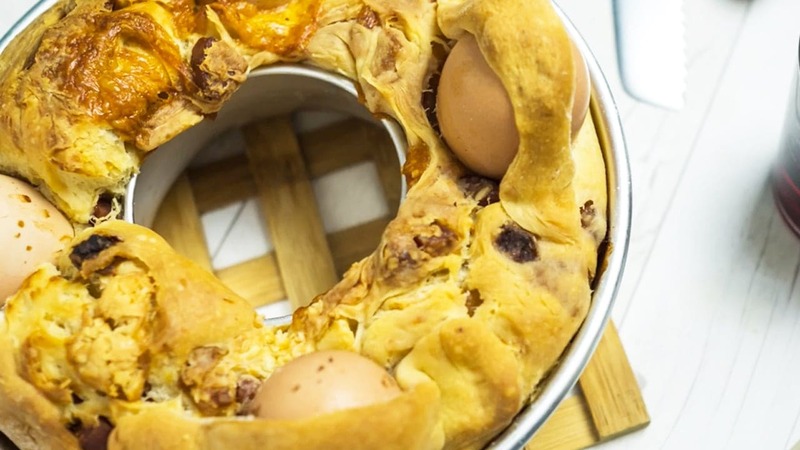 The link between this rustico and the meaning of Easter is further validated by the fact that the casatiello has in itself some strong symbologies. First of all, its circular shape and the eggs (symbols of the Resurrection) secured on top by pasta crosses symbolize the crown of thorns worn by Jesus Christ and the martyrdom suffered by Him for the salvation of all. Another strongly symbolic element is the presence of pecorino cheese, a cheese made from sheep’s milk that feeds the lamb, reminiscent of the lambs sacrificed to God in the Old Testament. 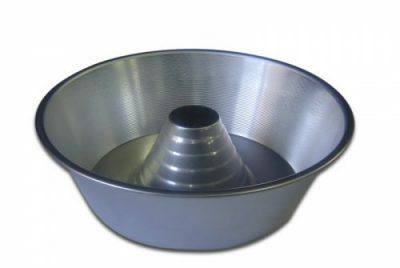 Casatiello is made in a ruoto, a characteristic circular pan with a central hole and high angled edges that allow the bread to rise, filling the pan and giving it a shape similar to a tall ciambellone. Some people cover the central hole of the pan and butter it, because often the dough will rise so much that it almost engulfs the hole. This is one of the most beautiful parts of the tradition that has been handed down from generation to generation. When it comes to stuffing the casatiello, the butchers and delicatessens in Naples frequently sell a ready-made mixture of meats and cheeses, which are specially selected to add the best flavor and texture. Sold by weight, they are usually cut into squares to speed up the preparation process for the cook. Walking through the historic center of Naples close to Easter, you can enjoy the wonderful and unique aromas of casatiello coming from the bakeries. If you happen to be on the famous shepherd’s road, San Gregorio Armeno, you can also find among the various figurines of the nativity scene the world-famous baker’s shop with casatiello displayed between the loaves of bread and pastiera. Part of the ritual involves preparing the casatiello in the company of friends or family. As with all the old traditional recipes, everyone thinks that they have the secret to preparing the best dough, which will include just the right amount of suet and pecorino, and the perfect balance between cured meats and cheeses. It is not uncommon for people to criticize their friends’ casatiello by saying things such as, “Your version has too much pepper,” “It’s too greasy,” “If you could taste what my grandmother made …,” “It’s too empty … I do it fuller,” … classic diatribes of those who think they have the “true” traditional recipe. When it comes to making the filling, there are those who add in mortadella and those who do not use cicoli, but the ingredients that cannot be left out are the pecorino, pepper, Neapolitan salami, and suet. 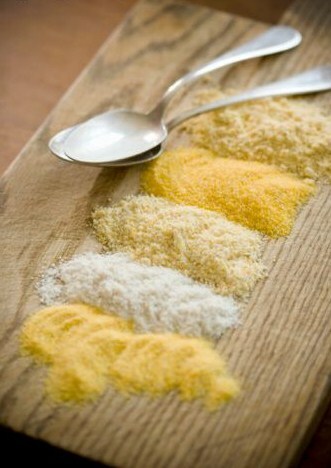 If you do not use these four ingredients, you are not preparing casatiello but another rustico. Traditionally, casatiello was baked in a wood-fired oven. Neapolitan women used to prepare the dough for casatiello at home, cuddling it like a child as part of the preparation and the leavening. They covered it with a blanket so as not to “let it get cold” and then carried it to a bakery and placed it in a wood-fired oven, waiting impatiently to see how it turned out. I have decided to share the recipe that my grandmother used and handed down to my mother, and that I now cook every year on Holy Saturday, hoping to be able to one day give it to my daughter along with all of the various traditions that revolve around this delicious bread. It comes from one of the Neapolitan cookbooks that I love most: La Cucina Napoletana by J. Carola Francesconi, which was given to me by my mother. 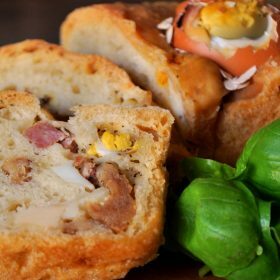 Casatiello is a Neapolitan Stuffed Bread recipe made during Easter time. It requires time prepare but it is absolutely delicious. Dissolve the brewer’s yeast in lukewarm water. Add half the lard, the flour, the salt, lots of black pepper, and the grated cheeses, and work vigorously for about 10 minutes until the mixture is homogeneous and smooth. Put the dough in a large bowl and cover with a dry tea towel, followed by a thicker towel, and let it rest for a couple of hours or until it has doubled in volume. While the dough is rising, with a kitchen knife cut the cheeses and salami into cubes and put them aside in a bowl together with the cicoli. Place the risen dough on a surface that has been generously sprinkled with flour. Use a rolling pin to work the dough into a rectangle shape. Then brush the dough with some of the remaining lard, fold the dough, and rework it. Repeat this process until you have used up all the lard indicated in the recipe. Set aside a small amount of dough; you will need it to form the crosses that will enclose the eggs. With the rest of the dough, form a rectangle about a centimeter high, and cover the entire surface with the salami, cicoli, and cheese mixture. Sprinkle the grated cheeses and black pepper all over the surface, then roll the dough up, tightening it as much as possible. Rub the suet over the entire roll. Place the roll in the greased pan and manipulate it into a donut shape, joining the two ends properly. Cover it again and leave it in a warm place to rise for roughly 2 hours. Before baking it, place the eggs on the casatiello at equal distances from each other and secure them with strips of dough in the form of crosses. Place it in a cold oven (NOT preheated) and bake it at 160 C (320 F) for the first 10 minutes, then increase the temperature to 170-180 C (340 F – 350 F) for another 50 minutes. Sugna, or suet, is to be added generously to the dough before stuffing it. Also rub suet on the outside, and use it to grease the ruoto pan. The preparation time is considerable, and the worst thing you can do is try to rush the process. Considering the leavening, cooking, and preparation, I suggest you factor in about 5 hours. Like all other countries on earth, Sardinia has had her fair share of problem but it hasn’t had a negative effect on the people at all – they are extremely hospitable and generous to a fault and will invite a stranger into their homes to share a meal at the drop of a hat. 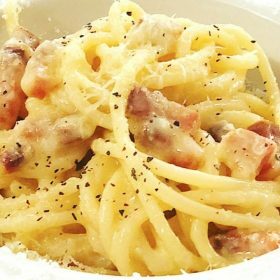 Pasta is a firm favorite wherever you go and given half a chance a plate of pasta with smoked pancetta and pecorino sardo will be on offer. Pasta is beloved in all of Italy and notwithstanding the differences between the regions, there is always one common denominator, la pasta. Probably the most traditional Sardinian pasta is malloreddus and fregola. This is the Sardinian interpretation of the Roman Pasta alla Carbonara. This pasta recipe is so easy to prepare and very delicious at the same. Try it for your next dinner! Place a large pot with water on the stove and bring to a boil. Cook the bavette until al dente in plenty of salted water. With a kitchen knife cut the pancetta into short strips. Heat a heavy based saucepan on medium-high heat, put the pancetta strips and fry them until golden. Add the garlic, the chilli and the parsley and fry for a second or two – remove from the heat and set aside. In a medium bowl, beat the eggs well. Drain the bavette well as soon as it’s cooked and put into the saucepan with the pancetta, the garlic, the chilli and the parsley and add the whisked eggs and half of the grated pecorino cheese – toss everything together well. Season to taste with a little salt and black pepper (if you need it). The heat from the bavette will be sufficient to cook the egg enough to leave it creamy – serve with the rest of the pecorino cheese. Italy makes some of the best tasting, aromatic, and artisan cheeses in the world. They claim their rightful spot at the top of the list for their extraordinary cheese products and the fantastic recipes derived from them. We’ve all heard of popular Italian cheeses such as Pecorino, Grana Padano, Parmigiano Reggiano, and Mozzarella di Bufala. Here’s a little information on the history of Italian cheeses. Italy produces approximately 600 different types of cheeses. 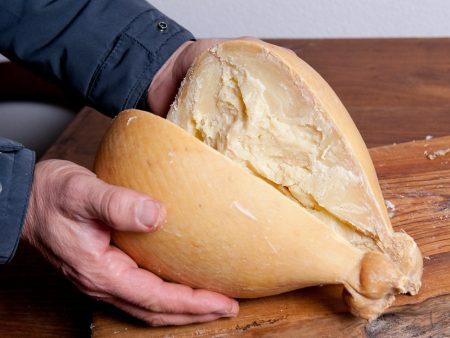 Some of their most famous cheeses date back centuries or even 2,000 years in the case of Pecorino Romano. The European Commission granted several of these cheeses protected status and the most famous of them have the DOP status. The Romans enjoyed cheese and loved eating and making it. Sheep’s milk Pecorino Romano was a treasured cheese at imperial banquets. It became a staple food for soldiers because it had a long shelf life. Ancient manuscripts written by Virgil, Canton, Pliny, Varro, and Columella record the Romans breeding of goats and sheep for cheese preparation. It was the Romans who introduced how to make hard cheese to countries throughout Europe. 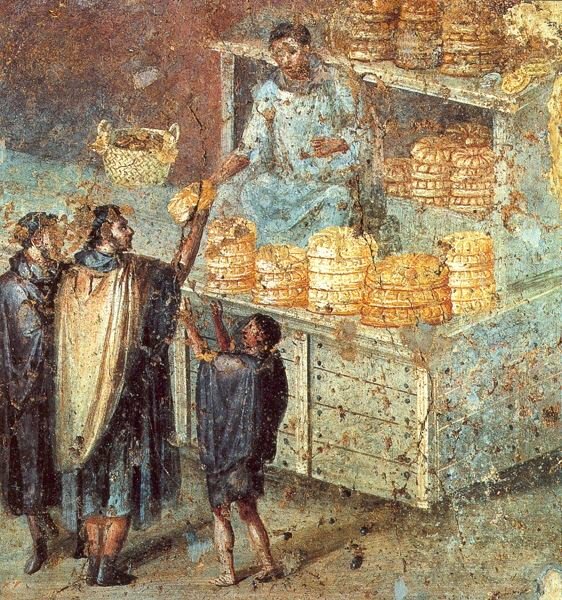 A special kitchen for cheese making, known as a caseale was a favorite room in many Roman homes. Monasteries in medieval Italy excelled at making high-quality cheese. 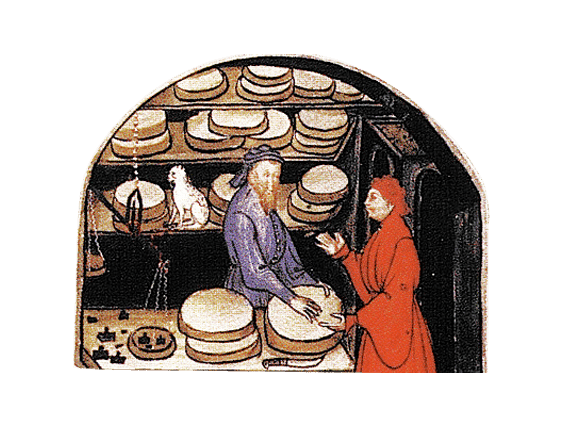 Cheese making in the middle ages paved the way for cheese to become a vital part of culture, food, and the economy. Eventually, cheese would become an integral part of Italy’s cuisine not just food of the monasteries. Cheese production in Italy sets their cheese apart from other cheese around the world. Cheese made from cow’s milk also became crucial to Italy’s food and culture. 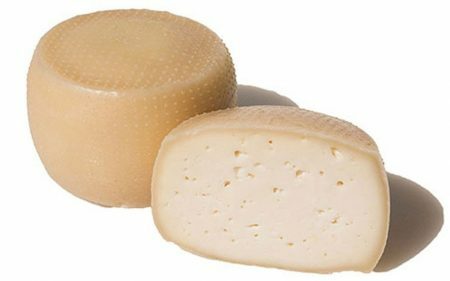 Approximately 1,000 years ago, Cistercian monks who lived in the lush Po Valley of Northern Italy created a cow’s milk cheese recipe called Grana using extra milk that they produced. History says that monks first made it in 1135 at the Abbey of Chiaravalle. This cheese was unique from others because of its grainy texture. Today it’s known as Grana Padano. The method used to make it today is almost exactly as it was hundreds of years ago. It’s a semi-fat, slowly aged, hard, cooked cheese crafted from raw cow’s milk. Parmigiano Reggiano is another important, well-documented Italian cheese that traveled the world and enhanced food and culture everywhere. Its history dates back centuries ago to 13th century Italy. Italian cheesemakers have remained faithful to its unique flavor and traditional crafting process. Parmigiano Reggiano had such a lofty status that famous diarist Samuel Pepys buried his wheel of cheese in the ground with his wine and other valuables when he saw the Great London fire of 1666 was heading straight for his house. Wheels of cheese during this time usually weighed about 84 lbs but they could weigh as much as 200 lbs. Pepys must have dug quite a large hole! Each region in Italy has its own local cheese that represents the local farming heritage and culture. Each area has traditional cheese making processes that characterize their specific region making their cheese unique. The Northern, Southern, and Central regions make a lot of the Italian cheeses that we know today. As we’ve learned, Italian cheese has been a crucial part of cuisines and cultures all over the world for hundreds of years. It dates back thousands of years to the Romans who cherished cheese. So, here it is; an extensive list of Italian cheeses and some facts about them. 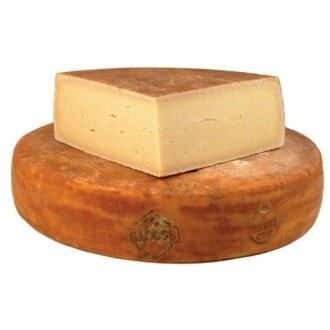 Bitto is an ancient Alpine cheese from Lombardy’s high Valtellina Mountains. It’s a unique cheese because Bitto contains milk from the nearly extinct Orobic goat and cow’s milk. 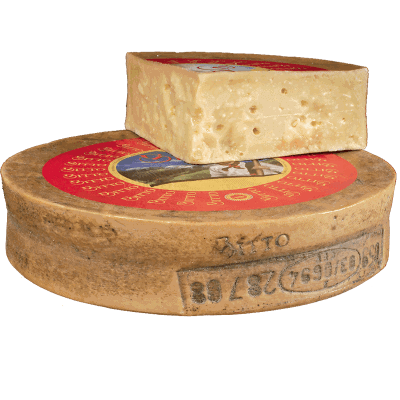 Bitto is a DOP cheese named after the Bitto river. 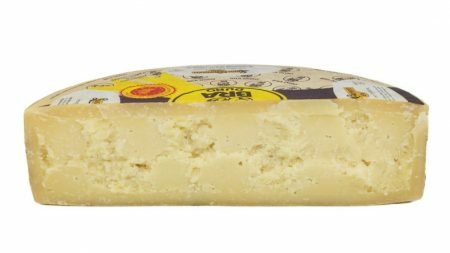 This hard or semi-hard cheese attributes its uniqueness to hand milking, high elevation pasturelands, Alpine biodiversity, and no use of enzymes, additives, or preservatives in the feed for the cows. By adding the goat milk, this cheese can age 10 years and longer. Serve Bitto at room temperature and with a dry, red wine such as Sfursat. The name Caciottina represents a broad range of cheese made in Central Italy in the Siena/Pienza region from either buffalo, sheep, or cow’s milk. This semi-soft artisan cheese has a firm and creamy texture and is a pale yellow. It has a pungent aroma and mild, milky, tangy, and sweet flavor. This cheese is easy to make but includes the unusual step that Italians call “stufatura” or steaming. It’s only briefly aged, under 2 months. There is no mention of whether this cheese has any special certifications or if its DOP. This cheese acquires its name from the residents of a town called Bagolino in the Brescia region. Its crafted from Bruna cow milk and has grassy aromas. This along with an almond taste are its unique signatures. There is a bit of a spicy finish that grows stronger as it ages. Never sold before it ages at least 1 year, Bagoss cheese can age for many years. A Slow Food Presidia protects its processing method and special features to prevent its extinction. Eat this cheese at room temperature to truly appreciate its nutty flavor. Bagoss aged under 2 years is a favorite filling for ravioli and great for grilling, risotto, or for grating on dishes. 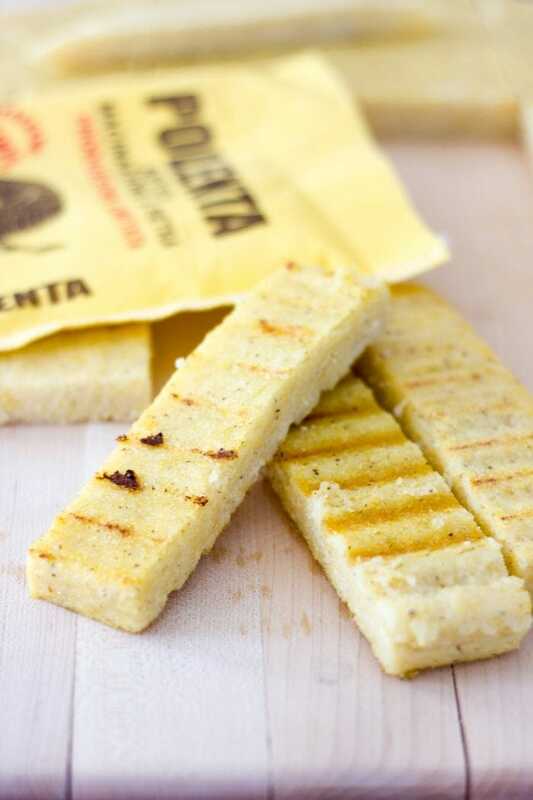 Many claim its best enjoyed melted on a piece of hot polenta. If you want to taste this cheese, try this Pappardelle recipe. Mozzarella cheese is popular worldwide and made from either water buffalo or cow’s milk. Its name comes from the word “mozza’ which means to cut. This name refers to the slicing of the milk curd during the process. Its excellent on bruschetta or homemade pizza. 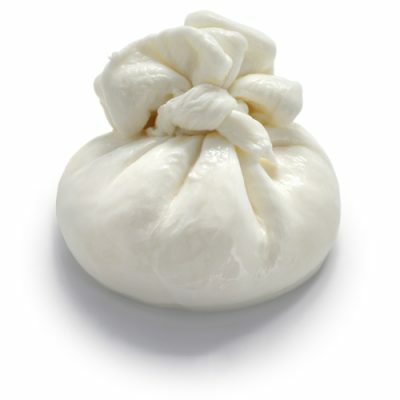 Mozzarella comes in a variety of sizes and shapes from small balls to braids. It has a mild, creamy texture and white porcelain skin. It tastes mild, sour, and milky. Italian mozzarella made from buffalo milk or Mozzarella di Bufala is Campania DOP from buffalo raised in Lazio and Campania. It pairs well with Beaujolais, white wines, and Sauvignon Blanc. The people of Biella, located in the Piemonte region, traditionally ate this semi-fat cheese during festivals. Artisans used raw milk from Oropa Red-Spotted cows native to the Biella area. Its flavor is full and intense, and Beddo usually ages for 8 to 15 days. People also eat it fresh, but when it matures, Beddo smells like herbs. Its aged in traditionally built rooms constructed from natural and stone walls. Protected by the Slow Food Foundation, cheesemakers craft it in copper cauldrons where the cheese is left for 12 hours and then heated. Cheesemakers make Beddo cheese all year round. Fontina cheese traces its roots back to the 12th century in the Alpine Aosta Valley in Northern Italy. Its flavor is nutty and mild with notes of grass, honey, and fruit. Fontina is the base for the traditional Italian fondue dish, Fonduta. But it is also used in the traditional Pizzoccheri recipe from Valtellina. This creamy cheese is firm and aged up to 3 months. It has small holes in it and is an excellent melting cheese. 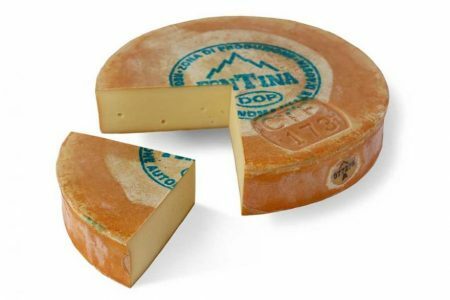 Fontina cheese was one of the first cheeses to be given DOP status, and it must contain milk from Aosta Valley cows. It’s a widely utilized cheese because of its ability to withstand heat. 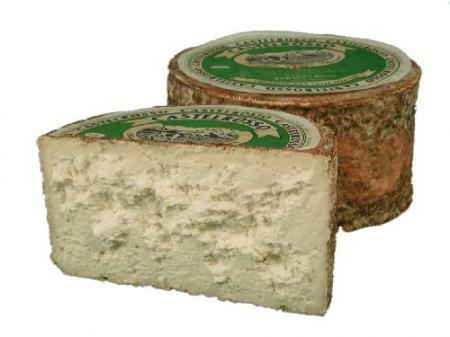 Castelmagno cheese has a unique texture and strong taste. Cheesemakers use cow’s milk and goat or sheep’s milk to create it. 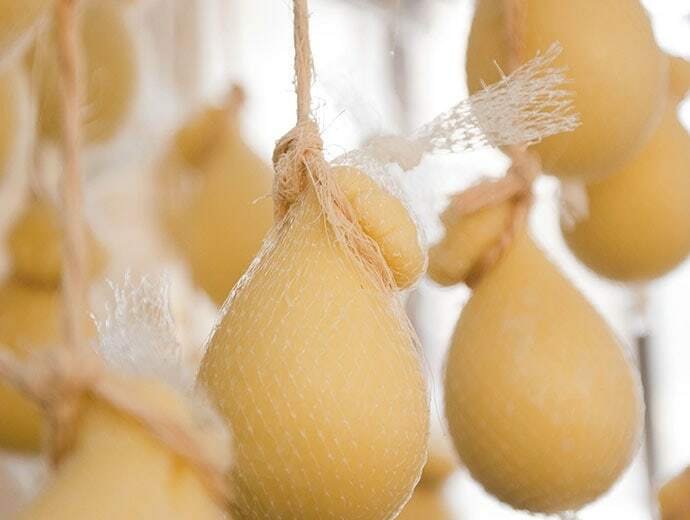 Castelmagno cheese ripens in drying rooms and damp cellars and its washed and turned regularly to encourage the natural growth of microorganisms that give it its sharp, yeasty aroma. 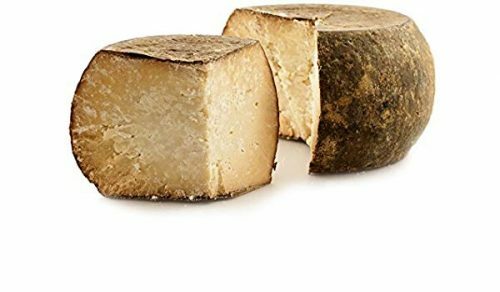 This ancient DOP semi-hard cheese was first made 1,000 years ago and got its name for the region where it’s traditionally produced, a commune in the Valle Grana. It is consumed on its own or with polenta, beef, rice, pasta, gnocchi, and more. This cow’s milk cheese is stretchy and soft with a pungent, nutty taste. Its name means “cheese on horseback.” The name comes from the traditional technique of roping cheese together and tossing them over a wooden beam or board to age them. Cheese artisans make Caciocavallo all over Southern Italy and the Balkans, but the most prized version is the Caciocavallo Podolico. Crafted using milk from Podolica cows, it’s one of the most aged and aromatic cheeses made in Italy. It pairs well with Primitivo red wine. Try this penne recipe for a taste of Caciocavallo. This DOP cheese’s heritage dates back to the Roman age when their cow herds traveled down to the Po River from the Alps. They grazed in the fields near a city named Gorgonzola and fed on grass called quartirolla. Rumor has it that Gorgonzola was born out of necessity because of the overwhelming number of cows there. Legends also say that its origins trace back to the 15th century when a cow-herder abandoned his work to spend time with his lover. To remedy the situation, he threw curd from the morning into the previous evening’s curd inventing a cheese that stays soft even after its aged. Cheesemakers puncture the cheese with sticks to dry it out, and this creates space for mold to grow inside of it. 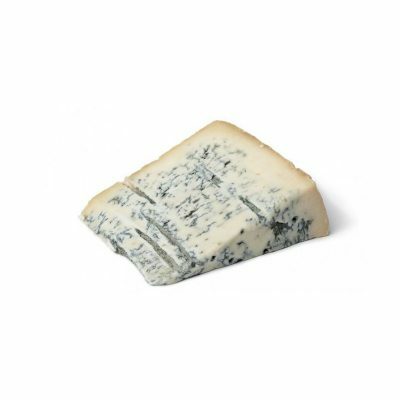 DOP Gorgonzola must be made exclusively from cows raised in Lombardy or Piedmont. It has a sweet but spicy flavor. Since it can be soft and creamy or spicy, it pairs with a variety of wines. Try this gnocchi recipe for a taste of Gorgonzola. Burrata is a fresh, decadent cheese made of heavy cream and mozzarella. So, it’s fitting that Burrata means “buttery” in Italian. Burrata comes from the Apulia region of Southern Italy. 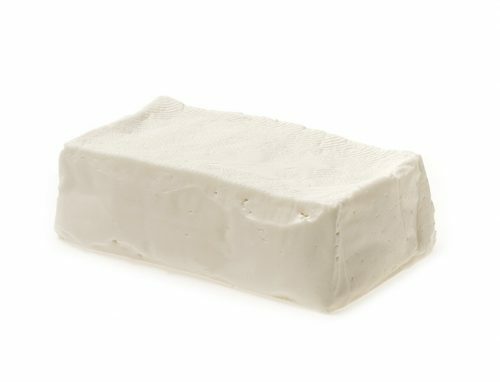 Cheese artisans craft this cheese with either cow’s or buffalo milk mozzarella on the outside and the inside is a mixture of fresh cream and curds. Burrata’s center oozes creamy and buttery cheese with pieces of mozzarella when you cut it open. It should be eaten immediately after its prepared since it contains fresh cheese. Eat it at room temperature and goes well with crusty bread, prosciutto, spaghetti, salads, and fresh tomatoes drizzled with olive oil. This cow’s milk cheese originates in the Po Valley region of Northern Italy, specifically Veneto and Lombardy. 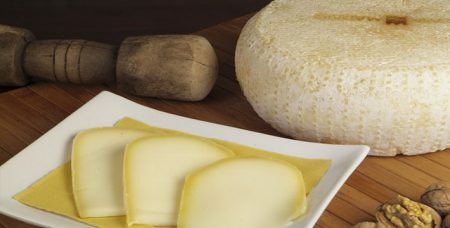 Not all Provolone is DOP, but Provolone Valpadana and Provolone del Monaco are. It’s a pale yellow semi-hard cheese with a firm and grainy texture. Provolone has a pleasant aroma and a buttery, mild, spicy, sweet, sharp, or tangy taste. It has two forms. The first, Provolone Piccante, ages for over 4 months and has a sharp taste. The second is Provolone Dolce, and it ages for around 2 to 3 months. It has a sweet taste. Provolone pairs well with aged and full-bodied red wines. It’s often served with homemade breads, flatbreads, and chutney. Try this ravioli recipe that uses Provolone to taste its creamy flavor. This triple-cream cheese is decadent and more a whipped cream than cheese. It’s fresh, mild, and spreadable. Mascarpone is a common ingredient of Tiramisu. This cheese comes from cow’s milk and originated in the Lombardy region of Southern Italy. It is made by adding citric acid or acetic acid to milk cream to curdle it. 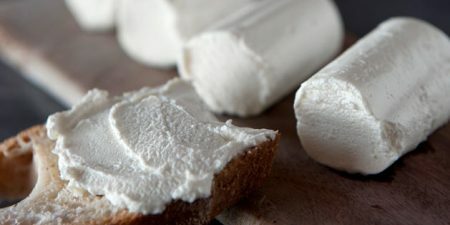 Mascarpone works well in savory or sweet recipes and is great at enhancing flavor without overpowering dishes. It pairs best with brandy, espresso, and chocolate. You can also use Mascarpone to thicken desert creams and puddings. 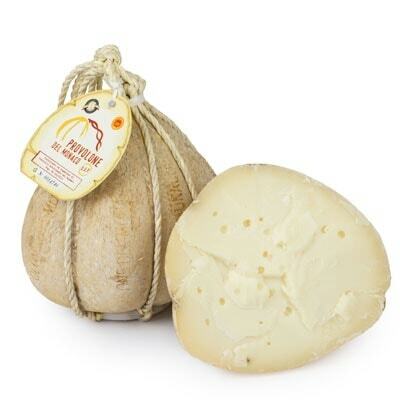 This semi-soft cheese is from Val Taleggio in Lombardy, hence the name Taleggio. It’s a soft, pungent cheese with a white interior. The rind is customarily pinkish-grey. 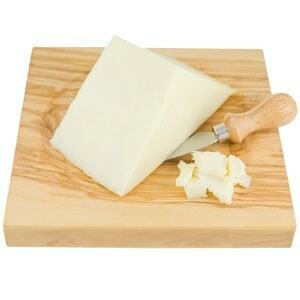 Taleggio has a mild, tangy, and meaty note with some fruity finishes. It’s moist and oozes providing a pleasant feeling in your mouth. Taleggio is a semi-soft cheese created from cow’s milk. It also was designated DOP. Giacomo Casanova reportedly consumed it before his romantic conquests because of its reputation as an aphrodisiac. It tastes fabulously grated on Rucola and Radicchio salads and pairs with a broad range of white and red wines as well as Italian Nebbiolo wines. 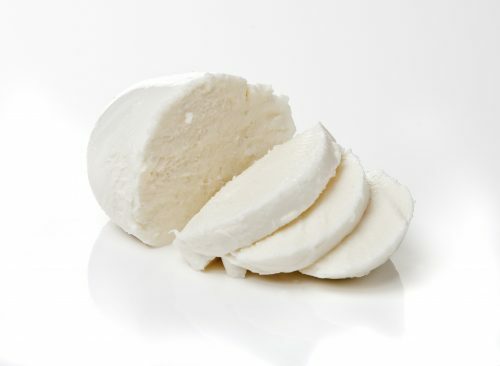 Tomello is a soft, fresh cheese crafted from raw cow’s milk. Its white with medium-sized holes and has a crumbly center. It seems to be made exclusively in Cammarata in Sicily an area known for its wine and food. Its slight aromatic smell is characteristic, and it’s sweet and slightly acidic. Tomello pairs well with medium-bodied and white wines. It also pairs well with Rauchbier. There is no mention as to whether it is a DOP cheese or not, but since it is so localized, it probably doesn’t need to be. Asiago is another popular Italian cheese that changes texture the longer its aged. When it’s fresh it’s smooth, and then it advances to crumbly as it ages. Asiago has a delicate and nutty flavor. Creamy cow’s milk from the Vicenza province makes Asiago. It’s a DOP cheese and also holds a certificate issued by a dedicated association. This certificate guarantees that genuine Asiago cheese meets quality standards and the people who make it adhere to strict guidelines. Asiago pairs with many foods and drinks but extra aged Asiago matches well with deli ham, crackers, green olives, and toasted bread. Here is an excellent Creamy Asiago Cheese Tortellini recipe. The name of this fresh cheese means “recooked.” It tastes sweet and creamy and has a white, lumpy and grainy appearance. 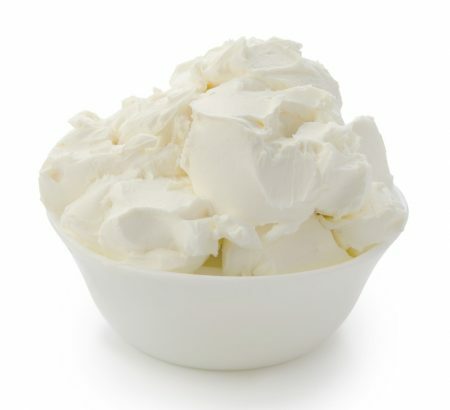 Ricotta made from sheep’s milk is popular in Italian desserts. Italians often beat it to a smooth texture and mix it with cocoa, cinnamon, or sugar. It’s also a primary ingredient in cannolis. Ricotta is a prominent component is Napoli’s Pastiera, a famous Italian Easter dessert. Of course, not all Ricottas are DOP. 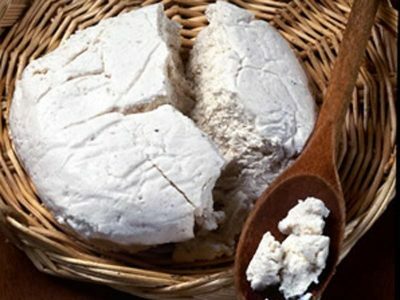 Some that have earned this label such as Ricotta Romana DOP must use sheep’s milk from Massese, Sarda, Sopravvissana, and Comisana breeds and they must be raised exclusively in the Lazio region. Some experts say that this Bruss is more like a dairy product instead of cheese because of the process to make it. Housewives created the cheese by combining pieces of cheese of various ages into glass or earthenware containers, and then milk is added to foster fermentation. Then they placed the cheese in a cool area for 60 days, and then a splash of grappa stops the fermentation. It’s a spreadable mixture. This ancient, classic cheese is still very popular and originated in Sogliano al Rubicone in the Emilia-Romagna region. 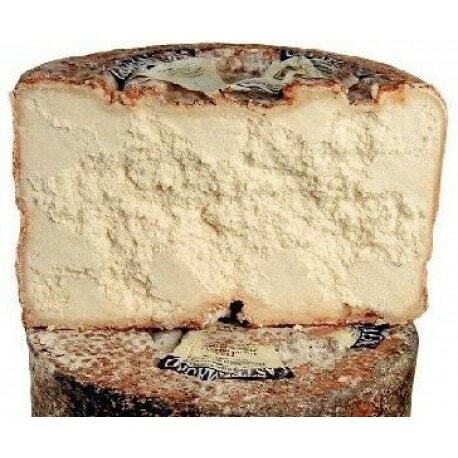 Formaggio di Fossa is a mixture of cow and sheep’s milk. The cheese is left to ripen in straw-lined, air-tight stone pits for 3 months to 100 days. In Sogliano, the four primary oval pits are granaries from the 14th century. Here the cheese wheels are buried during the final week of August and dug up on November 25th during a formal “sfossaturra.” Locals dedicated this day to the local patron saint, Saint Catherine of Alexandria. 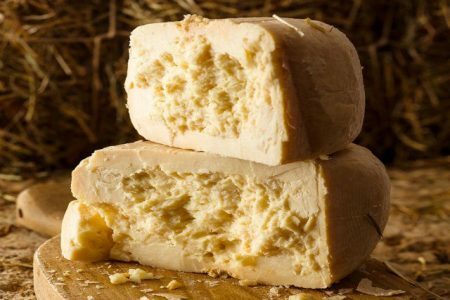 People can eat Formaggio di Fossa alone or use it in a number of recipes for gnocchi, passatelli, carpaccio, and as a dessert eaten with honey. This Alpine cheese is semi-aged and made from with unpasteurized milk from cows typical for the Veneto and Friuli Venezia Giulia regions. 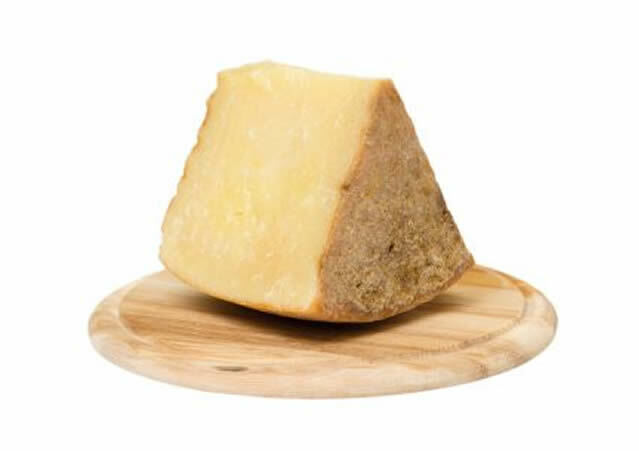 Montasio has a fruity, mild, nutty, and grassy flavor and is the primary ingredient in Frico, a traditional Friuli recipe. Montasio is DOP and dates back to the 13th century when Benedictine monks introduced it. Pair this cheese with a Sauvignon Blanc, Pinot Grigio, or Merlot. 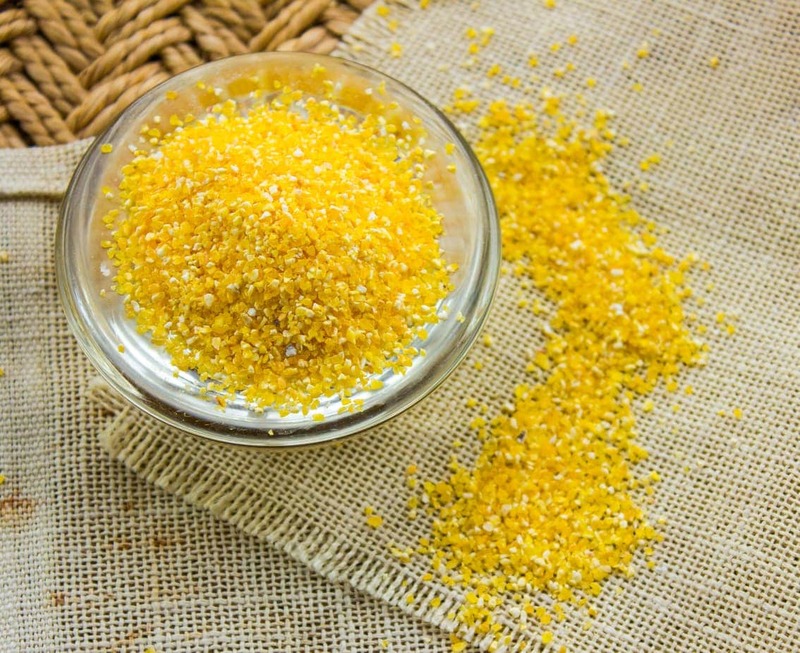 Montasio connoisseurs like it grated or shredded over polenta. 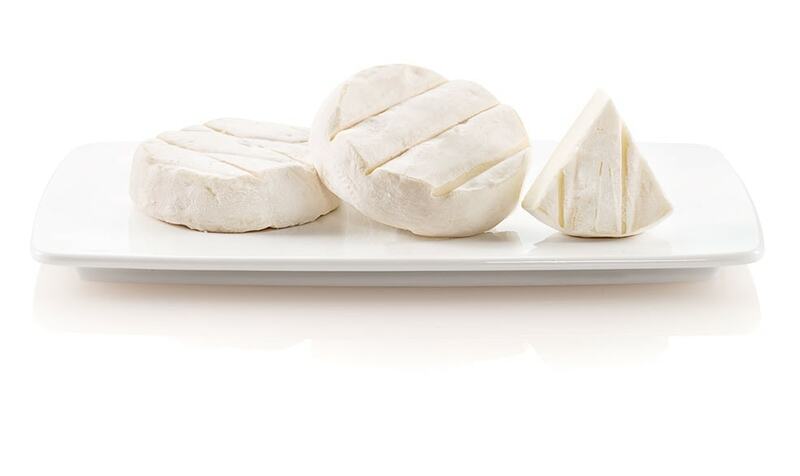 This broad term for creamy, soft goat cheeses comes from the word “capra” or goat in Italian. Caprino has 2 primary forms, caprino fresh or stagionato. Caprino cheesemakers in Italy make the cheese using traditional methods such as ladling the curds by hand and only using raw goat’s milk that’s unpasteurized. Soft and creamy Caprinos have lemony hints while the aged, firm Caprinos taste of cooked milk and nuts. The flavor in the older cheeses is subtler than that of, the younger ones. People usually eat this fresh cheese 4 days after they make it. It goes well with Merlot and Sauvignon Blanc wines to enhance its creaminess. Try this zucchini recipe for a taste of Caprino. This hard cheese is nutty flavored and made from raw cow’s milk. It’s usually aged around 2 to 3 years. There is a law that says only cheese produced in Reggio Emilia, Modena, Southern Mantova, and Parma can be called Parmigiano-Reggiano. The longer this cheese ages, the drier and crumblier the texture. It takes a minimum of 18 months to reach the consistency desirable for grating. Professional chefs all over the world use this artisan cheese. 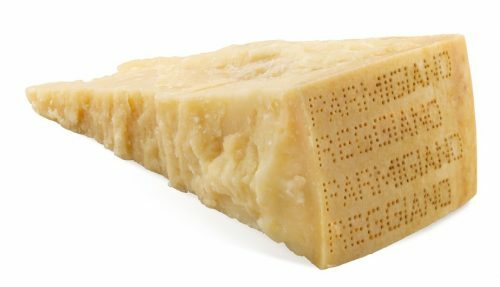 Parmigiano-Reggiano is delicious for preparing many recipes but also tastes excellent with fruit, wine, crackers, or sprinkled on soup, pasta, and rice. This cheese also has a DOP status. This old cheese is an excellent representation of Italy’s past. The name comes from the Italian word for sheep. Cheese made from sheep’s milk dates back 2,000 years to the Romans. Pecorino has a distinctive salty and strong flavor. Its preferred for use in savory pasta sauces such as Cacio e Pepe, Amatriciana, Gricia, and Carbonara. It’s also excellent with fava beans and red-wines that are full-bodied. Pecorino cheeses vary according to the particular region that produces them and their methods of production. Sometimes the taste is sweet and subtle while other varieties are spicy, briny, and tart. Common Pecorino Romano comes from Sardinia, Tuscany, and Lazio. Pecorino Romano is DOP. These two kinds of cheese belong to the same category of cheese. Cheesemakers use soft-ripened cow’s milk from the Emilia-Romagna region to make this cheese. These cheeses have no rinds and have a rich, buttery, somewhat tart taste. Crescenza and Squacquerone cheeses don’t ripen long leaving them soft and spreadable. They are extremely versatile and customarily produced in the shape of squares. People spread unleavened bread called piadina with Squacquerone as a mainstay of local food on the Adriatic coast. Crescenza cheese can also be made with water buffalo milk and comes from “stracca” the Italian word for tired because legend says it is crafted from cows that are tired of traversing the Alps seasonally. It pairs well with prosciutto and Rocket Salad. People also use it in risottos and focaccia as well as on pizza. Squacquerone di Romagna is DOP. It’s great with cold cuts and to fill fresh pasta. This cheese only uses milk from sheep that are Sarda-bred, and it requires drying near a fiery brazier for approximately 2 weeks. Fiore Sardo needs a lot of attention. Cheesemakers must wash the rind regularly with a solution of olive oil, salt, and wine vinegar and turn the wheels often. Also known as Pecorino Sardo, Fiore Sardo is DOP designated. The interior of the cheese has a hard, grainy texture with a salty tang and caramel sweetness. The taste also hints of fruit. 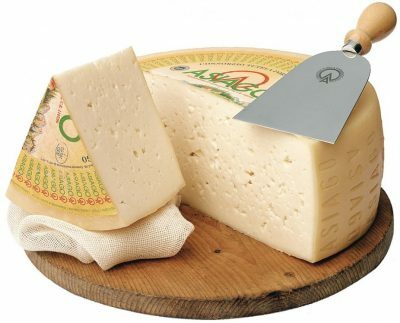 Younger cheese can be cut into cubes or slices while older Fiore Sardo is excellent grated on pasta or polenta. Pane Frattau is a typical Sardinia dish that uses this cheese. Casizolu is a highly prized cheese made of stretched cow’s milk curds. It’s an ancient cheese produced in the Montiferru region of Sardinia. Women made the cheese in the past by processing fresh milk and stretching the milk curds in hot water to form the pear shape that this cheese is known for. When matured over 2 to 3 months, the cheese begins to release grassy buttermilk notes of flavor that hint of almonds and damp forest. Casizolu is only available from late fall to early summer after the lactation period of the cows that provide the milk. Generally, people eat this cheese alone, but it adds great flavor to recipes such as Zuppa Gallurese. Casizolu pairs well with fruity white wines. This semi-firm, sweet flavored cheese comes to us from the Campania region of Italy. A Casa Madaio farm located in Cilento, Campania is the only place that makes Accasciato. Its crafted from cow and buffalo milk. These two kinds of milk are coagulated, drained, and then aged for 40 to 60 days. The name means “collapsed” in Italian. This soft cheese is creamy with a yellow rind. It’s an opaque white paste on the inside. An Italian wine would pair best with this cheese. This cheese’s name comes from its pungent aroma and originated in Val di Fiemme and Val di Fassa. 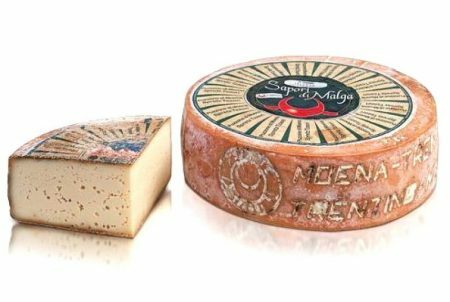 Puzzone di Moena is a semi-hard cheese that ripens in caves that have high levels of humidity. This environment increases the fermentation in the cheese. Other names include Moena Stinker and Spretz Tzaori. This cheese received DOP status in September of 2014. Puzzone di Moena is an elastic, yellowish paste with wide-spread holes. It pairs well with beers, red wines, green and rose tomato preserves, and wholemeal bread. It’s a full fat cheese made from raw cow’s milk. Here is a tasty potato dumpling recipe that uses it. 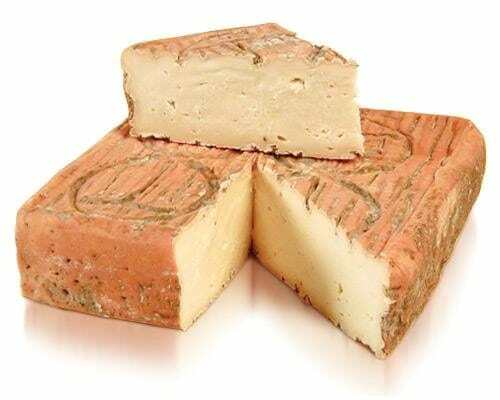 Bra is a hard cheese that cheesemakers in the Piedmont region of Italy produce. It comes from the town called Bra in Cuneo, Piedmont. While other areas make this cheese, only Bra cheese made here is considered authentic. Bra is DOP recognized and made from cow’s milk. Depending on the seasoning time, Bra can taste delicate and fresh or saltier and more intense. Since it is slightly greasy, it pairs well with foods that are somewhat acidic or fruits such as grapes, grapefruits, blueberries, and currants. Many simply love it with a slice of bread. Bra Tenero pairs well with red or white wines that aren’t too intense while Bra Duro pairs better with full-bodied wines. This favorite cheese produced in Sicily is a hard, stretched curd cheese. Ragusano comes shaped like a brick and uses unpasteurized cow’s milk. Its formed into a sphere after the curds are chopped and heated and then shaped to a parallelepiped using wooden boards called mastredda. It hangs, aging for months until the rind becomes a golden color. It smells like orange blossoms and Mediterranean shrubs. Ragusano has been DOP recognized since 1996. It has a spicy, sweet, and savory flavor and pairs well with dark, aged beers, and full-bodied red wines. Here is a rabbit recipe that showcases Ragusano. This sheep’s milk cheese comes from Sicily. It’s firm, hard, white, and rindless with a salty flavor. The name Ricotta means “re-cooked” and Salata means “salted.” It ages at least for 90 days and comes from the whey of the sheep’s milk that people use to produce Pecorino Romano. People often crumble this cheese in salads. 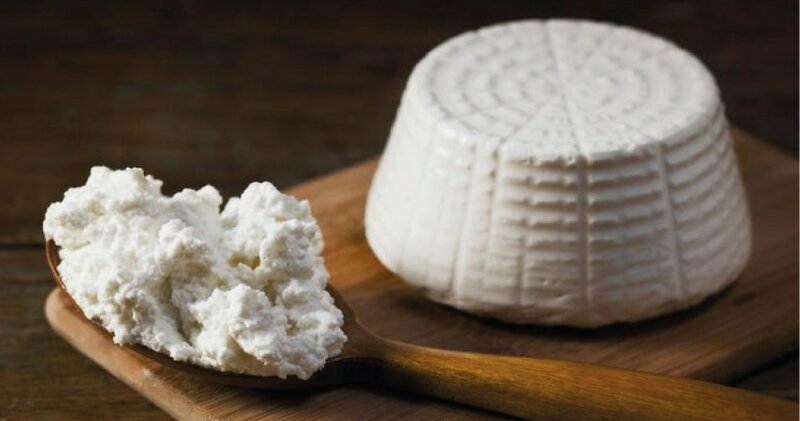 Ricotta Salata pairs well with white wines such as Chardonnay, Gallura, Vermentino di Gallura, and Nuragus. Try this delicious cheese in this pasta recipe with lemon and herbs. 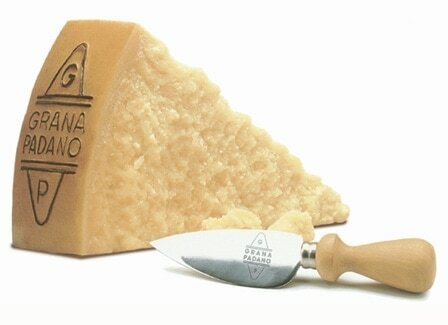 Grana Padano is from the Po River Valley and is in the parmesan family. It’s a DOP cheese that Cistercian monks of Chiaravalle created in the 12th century. This cheese comes from semi-skinned, unpasteurized cow’s milk and usually ages for approximately 2 years. It is also sold at other ripening ages such as 15-18 months, 9-16 months, and over 16 or 20 months. “Grana” is grainy in Italian and accurately describes its texture. Its flavors become complex and savory the longer it ages. It also crumbles more as it gets older. This cheese pairs well with Gavi white wine, Barolo, or Zinfandel. A delicious.Tortelli di Zucca recipe showcases this cheese well. 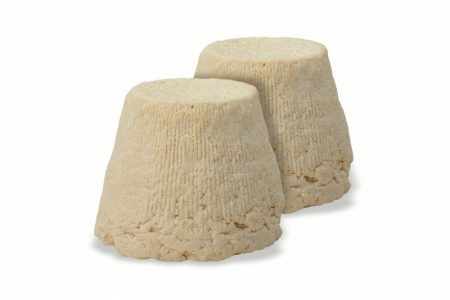 This sheep and cow’s milk cheese comes to us from Campania, Molise, and Apulia. It’s a chewy, stringy, semi-soft, white cheese with a smoky, milky flavor. Cheesemakers shape this cheese into a pear similar to provolone. In the final stages of the cheesemaking process, this cheese hangs in strips and ripens for around 2 weeks. After aging for two weeks, its either smoked or sold as is. One variety, known as “Scamorze Affumicate” smokes over lit straw for 10-15 minutes. There is also a plain Scamorza available after a few days of aging. These cheeses melt well and have a smoky flavor with a caramel note. People use it in baked dishes or on top of prosciutto. It pairs well with Pino Grigio, Chardonnay, or Orvieto and certain versions such as Smoked Buffalo Scamorza are DOP. Try this Arugula Salad with Pan-fried Scarmoza recipe. Made from pasteurized cow’s milk, Piave comes from Veneto, Italy. It’s a hard cheese with a dense, crystalline, and flaky texture. This cheese has a sweet flavor, and it pairs well with red wines that are full-bodied or Zinfandels. 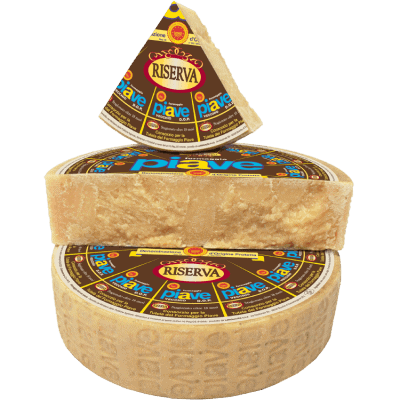 Piave starts as a white colored cheese that changes to a straw color as it ages. There are no holes in this cheese. Piave is also DOP protected and can be served plain or grated. Here is a Cacio e Pepe pasta recipe that uses Piave cheese. This pasteurized cow’s milk cheese is an ancient and rare semi-hard cheese. It originated in the Piedmont region and looks similar to Castelmagno. 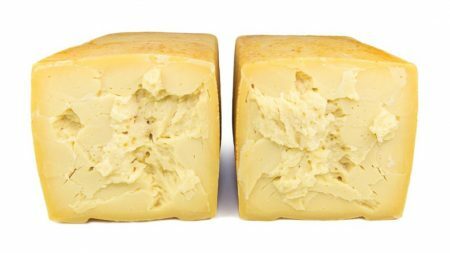 Toma Brusca has a mild, buttery, and lactic taste with a bit of a residual tang similar to English cheddar cheeses. Cheesemakers craft Toma Brusca from rennet, whole cow’s milk, and milk and salt enzymes. It ages in cellars underground on shelves made from silver fir for approximately 60 days or more. It pairs well with chestnut honey, quince chutney, red wines, polenta, black rye bread, and grape mostarda. Try this fondue recipe for a taste of Toma Brusca. We hope you’ve enjoyed learning about some of Italy’s best cheeses. Of course, this list doesn’t cover all 600 kinds of cheese, but these cheeses illustrate just how serious Italians are at crafting the best cheese products. What cheese are we missing? Let us know in the comments below! A Japanese legend tells of a warrior who became so old that he outlived his family. His most precious memory was of playing underneath a cherry tree, but when it died, he was so devastated that he wanted to die too, despite the fact that a new tree had been planted nearby. That winter, the old warrior begged the tree to blossom once more and vowed that he would take his own life if his wish be granted. It was and the old man committed hara-kiri under the dead tree, his spirit and his blood soaking down to the roots to color, forever, the fruit of the tree. It is said that the tree blooms every year on the old warrior’s birthday. Years ago Maraschino cherries were steeped in 70% proof Maraschino cordial made from the juice of the Italian Dalmatian Marasca wild cherry. 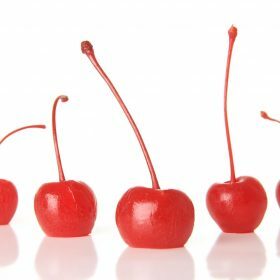 Today the commercial process puts the cherries into a soup of of sodium metabisulfate, calcium chloride, and citric acid which serves as a brining liquid – then it’s soaked in corn syrup and a fructose solution. The cherries are artificially flavored and dyed red or green. Now that you know this, wouldn’t you prefer to make your own? Learn the story and how to make this delicious and peculiar cherries. In a large pot boil water and salt, stirring until the salt is dissolved. Allow to cool for 10 minutes – pour this over the pitted sweet cherries. Cover and set aside 12 hours or overnight. Drain cherries, discard the brine and rinse well in cold water. In a medium-sized pot, mix the sugar, the lemon juice and the red food coloring together and just-just bring to a boil, stirring well to dissolve sugar. Remember remove from heat as soon as the sugar is dissolved. Pour over the cherries, cover, and let stand for 24 hours. Drain cherries but reserve the juice. Bring the reserved juice to a boil again, remove from heat and stir in the almond extract that you pour over the cherries. Pack the cherries and the juice in hot sterilized jars and seal well. Use the maraschino cherries with Italian cannolis or serve them with pizzelle if you don’t want to use them in a more traditional Martini drink. Authentic Italian Recipes from Nonna Box Blog at WordPress.com.